“Distant shores” is an interesting detail here to describe who is to rejoice at God’s reign. It sounds like based on the context that “distant shores” is being used in a similar way as “the ends of the earth” is used to describe where we are to spread the Good News in the new testament. Then God is described as having clouds and thick darkness surrounding Him. This strikes me as somewhat counterintuitive. The clouds I get as God has shown up in this form many times in the old testament, but darkness surrounding Him…I thought God was always associated with light rather than darkness. I guess if one thinks of an approaching storm as the combination of clouds and darkness it makes more sense. That interpretation seems to fit the rest of the passage where “His lightning lights up the world; the earth sees and trembles”. The word picture I get is of an approaching thunderstorm full of wind, rain, thunder, and lightening. I have been in storms like this in a tent and they are very scary. 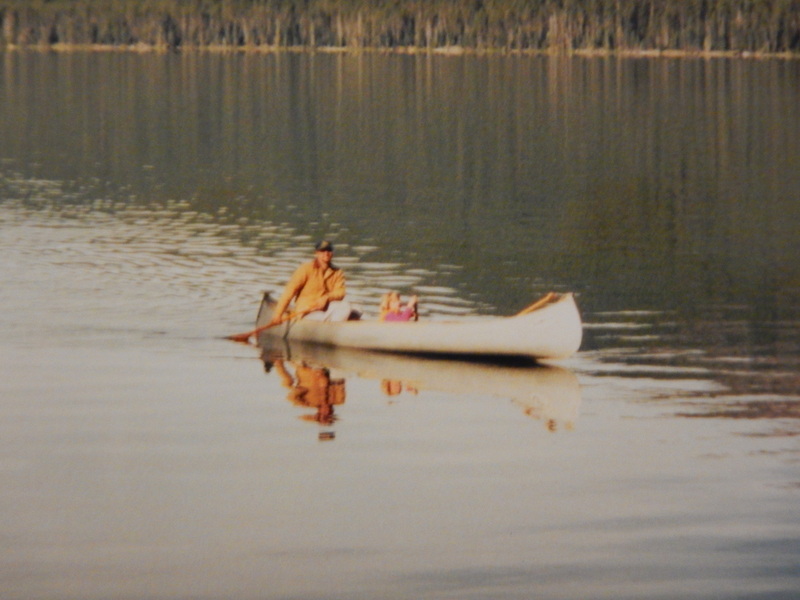 One of the most memorable times was when my wife and our young daughters were canoe camping in the Cascade mountains of Washington. We canoed to the camp site and set up our tent just in time for a huge thunderstorm to show up just as the light was fading in the evening. We got into our tents and our tired children went right to sleep. We started to doze but were soon wide awake as the storm arrived in earnest. About halfway through the storm the bottom of our tent began to feel like a waterbed. We had pitched it in a bowl-shaped depression that was filling with water. I wasn’t keen on testing our tent’s waterproofing prowess so I put on my rain coat, grabbed the flashlight, and a children’s plastic canoe paddle that we had brought so my daughters could help paddle the canoe. I didn’t really have a plan for what I would do with the paddle, but it seemed like a good idea at the time. God was watching over us that night and it turned out the paddle was just what I needed. He was there in the clouds and darkness. I began to dig a trench to direct the water away from the tent. As I dug I apparently uncovered an opening into a buried lava tube over which we were camped. The water simply disappeared down the hole and I was left standing there in the rain looking like a crazy man. My sister-in-law, her husband, and their kids were camped nearby and they saw me through the lightening flashes and can attest to the fact that I did look like a crazy man wielding my paddle in the midst of the storm. Thankfully my daughters slept right through it all and my wife and I still marvel at the way things worked out (by God’s grace)….but I digress. The last part of this passage contains an interesting “riffle”. It says “All who worship images are put to shame, those who boast in idols— worship him, all you gods!”. Just which “gods” is God referring to? It sounds like he means any of us who fashion ourselves to be the god of our own destiny. We replace God with idols and images. It is almost as if God forsaw the invention of the television and movies. What a perfect vehicle for spreading the narcissistic worship of images and idols (fame and beauty). Prayer: Thank You God for watching over me in the midst of clouds and darkness. Help me to worship You rather than images and idols. This entry was posted in Covenant, Discernment, Discipleship, Faith, Following God, Free Will, Life Together, Miracles, Nature, Psalms, The Earthly Realm, The Nature of God, Trusting God and tagged bible, bible study, Canoe, Christianity, cloud, Daily devotional, faith, thunderstorm, water. Bookmark the permalink.